After Donald J. Trump was elected President of the United States, he began to interview many different individuals for possible Cabinet and Administration positions. Immediately, there were nearly daily leaks as to whom was being considered for what position, and whether a given individual’s stock was rising or falling. After this had gone on for a few weeks — with sometimes wildly differing information coming out of Trump Tower and its environs — I talked with my close friend and co-blogger, Bruce Henderson, and wondered if Trump was carrying out a classic information security exercise: giving specific bits of information to specific individuals and then seeing if that information showed up in the press the next day or so. If it did, then the source of that leak was unmistakable identified. Henderson thought it plausible, but there was no way to prove that this was going on. It is interesting, however, to note that several individuals who were once considered “shoo-ins” for a position in the Trump Administration are now on the outside looking in. I haven’t seen a lot of follow-up about that (well, except now for the main headline on Drudge), but it’s very clear that Trump just nailed the existing Intelligence agencies for leaking this information. He knows it, and they know it. And guess what happens less than 12 hours later? Well played, President-Elect Trump. 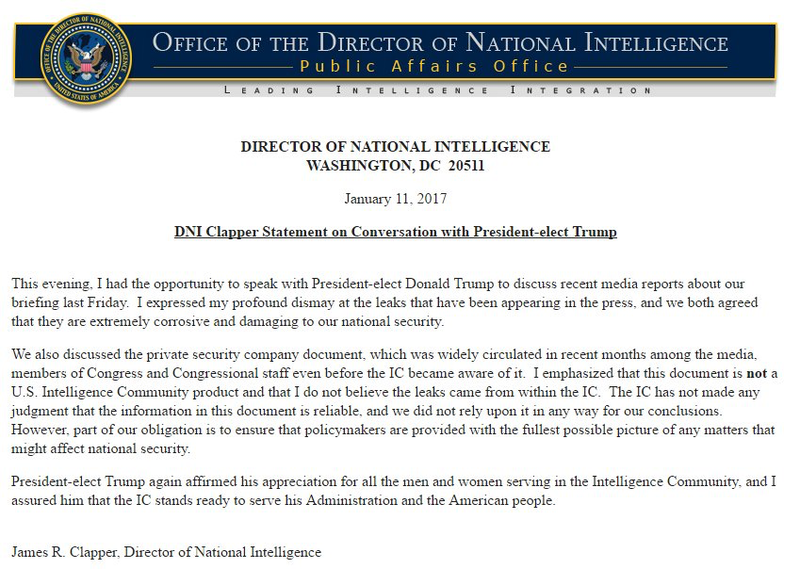 I suspect we may see some top-level housecleaning when Dan Coats (Director of National Intelligence and Clapper’s replacement), Mike Pompeo (Director of the CIA) and Gen. Mike Flynn (National Security Advisor) are confirmed and in place. ..bruce..